Venezuela has denounced US President Donald Trump over his “warmongering and interventionist” remarks which it says promote a “military uprising” against President Nicolas Maduro. 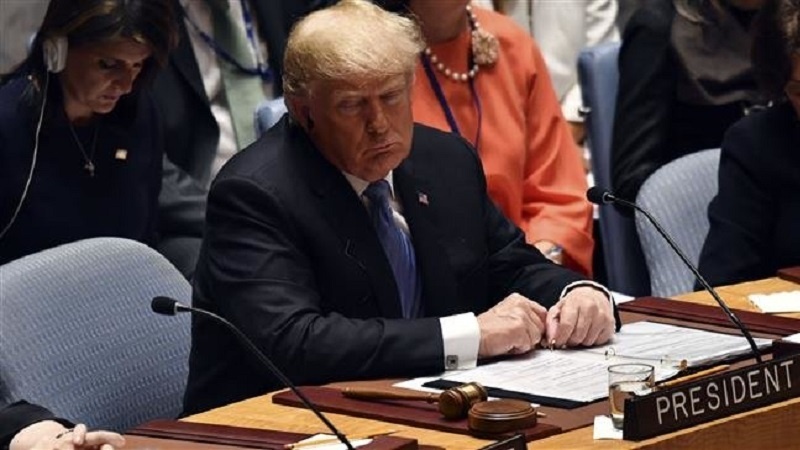 Speaking on the sidelines of the UN General Assembly on Tuesday, Trump said the regime in Venezuela, “could be toppled very quickly by the military if the military decides to do that”. The United States on Tuesday imposed new sanctions on Maduro’s wife and several of his top allies to further increase pressure on the government which is already grappling with an economic crisis. The Latin American country is under criticism for allegedly limiting the powers of the opposition-run legislature, jailing opposition politicians and creating a parallel congress with unlimited powers, accusations which Maduro vehemently denies. Venezuela, once among Latin America’s richest countries, is in a fourth year of recession. Economists at the International Monetary Fund (IMF) have forecasted a potential inflation rate of one million percent for Venezuela this year. About 2.3 million Venezuelans have left their home country since 2015, more than 500,000 only this year, mostly for Brazil, Chile, Colombia, Ecuador and Peru, in search of a better life. About 90 percent of Venezuelans now live in poverty, while more than 60 percent of people interviewed in a survey conducted by three universities earlier this year admitted to waking up hungry over the past three months because they lacked the means to buy food. The Maduro government has blamed the United States and its sanctions. The opposition have blamed government mismanagement.